There is no tradition more defining and ubiquitous in the distinct Guaraní/Spanish fusion that is Paraguayan culture than drinking terere. 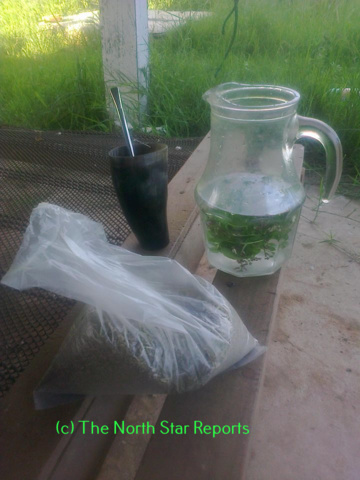 At its most basic terere is nothing more than a tea prepared from the leave of a native tree – Ka’a mata, Yerba mate or Iiex paraguariensis in Guarani, Spanish and Latin respectively; but it is much more than a simple refreshment. The consumption of terere is often a highly complex social ritual, one that also highlights the extreme prevalence of traditional medicine in contemporary Paraguayan life. It is not without cause that Paraguayan’s claim to live in La Republica de Terere – The Terere Republic. Drinking terere requires rather specific equipment, befitting the national symbol of a nation as idiosyncratic as Paraguay. First and foremost the Ka’a itself; sources range from homegrown trees to national brands such as Colón and Kurupi touting lables like Lite! and Fit!. The Ka’a goes in a guampa, a vessel traditionally made of horn that is used only for drinking terere; although a wide variety of guampas exist in contemporary Paraguay they are all used only for terere. Next, the mbombia, a metal straw with a slight curve and a wide spoonlike filter at one end. Finally, a jara or pitcher to hold the water that will be poured into the guampa to make turn the dry ka’a into terere. With all the requisite equipment assembled preparing the drink is just the first step in a lengthy and complex social ritual practiced by millions of Paraguayans daily. The most immediately apparent social aspect of terere consumption is that it is a shared activity – the guampa is literally passed from person to person, all of whom drink through the same mbombia. Throughout the course of drinking one person will hold the jara, it is traditionally the youngest person participating, never a visitor and generally a female. The server pours a small quantity of water into the guampa, passes it and receives it again once it has been drunk. In this manner everyone participates and the server controls the pace of the consumption; it is very bad manners to hold onto the guampa for a lengthy period of time while drinking, as is adjusting a mbombia that someone else has put in the guampa. When a young person is allowed to participate for more than a drink or two it is a sign of acknowledgment from the rest of the group of their maturity, their fitness to join adult company. The group consumption of terere is nothing short of a microcosm of the greater societal relations between people of different sexes and ages. Less immediately but no less obviously apparent is that terere consumption often takes a very long time; something that highlights the social mores of spending time with friends and family and taking time to relax. Together these two values demonstrate that the idea that quality of time spent together versus of quantity of time spent together is reversed in traditional Paraguayan culture. Paraguayans, particularly from rural or traditional backgrounds, place a great amount of importance on not rushing and simply enjoying the moments they have – a perfect example of which is taking a half an hour to drink a few hundred milliliters of water. Consuming terere, an inherently social activity, places great emphasis on spending time with family and friends, even though the time is spent drinking water and talking. The guampa and mbombia are symbols of Paraguay not because terere is a national custom, they are symbols of Paraguay because they are the centerpiece in a custom that demonstrates the mindset of a nation. A final typical component of terere is a poha ñana, leaves, twigs, roots or flowers added to the mix, cut, mashed or whole. These plants some the majority of which are endemic to Paraguay, not only change the flavor of the terere from the slightly bitter taste of ka’a to tangy Naranja hai rogue or undrinkably bitter Ajenjo but also are used by huge numbers of people every day to treat a wide variety of physical ailments. For example, Yerba de Lucero or Pluchea sagittalis is used by many people to treat stomachaches and diarrhea while others add Siete Sangria or Cuphea racemosa to there terere each morning in order to control high blood pressure. Paraguayans from all walks of life take pride in their knowledge of poha ñanas and nearly every adult in the country consumes them daily with their terere. Paraguay is an idiosyncratic nation. Officially bilingual with Guaraní and Spanish the vast majority of the popluation prefers to speak Jopara a mix of the two. It is a nation of immigrants – German Mennonites and Japanese colonists have carved out places for themselves in the heart of South America. It is a young country, only just coming to terms with its newfound freedom after decades of harsh, dictatorial rule. There is in effect, no such thing as a typical Paraguayan, unles one defines the typcial Paraguayan to be someone who drinks terere. Noah Goyke graduated from CSS in May of 2012 with a Bachelor of Arts in Biology and a minor in Chemistry. He is currently serving with the Peace Corps in Paraguay and studying for a Masters of Science in Forestry at Michigan Technological University. The North Star Reports publishes edited essays from our students, particularly from those who are currently stationed, or will soon be stationed abroad. Students have reported from Mongolia, Southern China, Shanghai, Colombia, Norway, northeastern China, Nicaragua, Micronesia, The Netherlands, Tanzania, Ireland, El Salvador, England, Finland, Russia, Cyprus, and Haiti. We also publish student reviews of books, documentaries, and films, and analysis of current events from around the world. We will post their dispatches, and report on their interactions with the North Star Reports students and teachers. We thank The Department of History and Politics and the School of Arts and Letters of The College of St. Scholastica for their generous financial support for The North Star Reports and The Middle Ground Journal.